In this post, join us as we launch a test payload with our planned equipment (GoPro Camera, Colbert Platform, Astronaut Ice Cream) to ensure everything will be ready for the actual Colbert launch. Come Launch with Us! This is the story of our launch to assist The Late Show with Stephen Colbert to send Astronaut Ice Cream to near-space for the first time! Perhaps you recognize this post's cover photo from a recent Late Show with Stephen Colbert skit: Astronaut Ice Cream is a Lie. Indeed, that skit used Launch with Us planning and flight hardware to plan for, execute, and retrieve the space ice cream payload. To make sure that we reached our objective altitude, we had to ensure that we chose the proper launch configuration. How did we do it? More about predicting altitude is below, while more details on the story of the Colbert launch itself will be coming in the next blog posts! Our return to flight after the winter! This mission conducted a number of experiments that we will be briefing in the weeks to come. This was our first launch with an object being video taped during flight - we launched an apple pie into near-space! "Pics or it didn't happen." This article will make sure that this is one phrase you'll be ready to address before (and after) your next near-space balloon launch. Learn all about different camera options in this week's blog post. After our first successful balloon launch with EFT-2 (still to be recovered), plans for EFT-3 were immediately underway with great enthusiasm and vigor. The biggest planned improvement (aside from launching in a warmer location) to the hardware arsenal for EFT-3 would aim to prevent the payload from getting stuck in the tree, by means of a “cut-down” circuit. The thought of the cut-down circuit would be to attach the payload to the parachute via a single string, and activate a mechanism which would sever that attachment and allow the payload to fall from the tree while the parachute remains suspended in any branches. The original concept would use the phone as the activation mechanism. By playing an audio signal (none other than the Star Spangled Banner for us) from the phone, it would trigger a signal in a circuit and trigger a relay to dump current from a small battery through a piece of Nichrome wire. The hot Nichrome wire would melt the attachment to the parachute, and voila! The payload would fall from the tree. Unfortunately, the cut-down circuit was abandoned last-minute due to insufficient time for prototyping and getting the circuit ready. However, there are plans to use the cut-down circuit as a means for delaying the deployment of the parachute on descent in the future to further reduce mission distance. In addition to the cut-down prototype, we were ready to try for a higher altitude in order to capture more spectacular pictures. The Kaymont 600 balloon has a published burst altitude of 75,000-90,000 feet. The plan was to fill it with an entire 125 cu ft. tank again, which is an overfill condition and would result in a pre-mature burst altitude somewhere below the published burst altitude, but would allow us a shorter driving distance for recovery. The last major detail was planning the location. Priority 1: it should be warmer than the first two launches. Priority 2: again, let's do a warm launch! The team decided to take a flight to Durham, NC to visit a family member currently attending Duke University there and launch in North Carolina (warm!). The launch date was selected for the March 13 weekend and plane tickets were booked. A Test Readiness Review (TRR) meeting was held again 1 week prior to ensure that nothing was overlooked and that the pre-flights were completed and go/no-go launch criteria established. The hardware configuration for EFT-3 was exactly the same as with EFT-2, with the exception of using a smaller parachute for a faster descent, and a Kaymont 600 balloon instead of a 350 for additional altitude before burst. The cell phone was a different model, but served an identical purpose by running the latest TM software for EFT-3. In addition to much more rigorous flight planning, the highest risks for EFT-2 were determined as outlined in the chart below. The cut-down device had been originally planned to retire the "tree landing" risk, but had to be abandoned last minute due to lack of testing. The Telemetry (TM) software was updated for EFT-3 to allow for a few improvements and to test some theories for future flights. Mainly, the TM software was updated to be able to receive commands once back on the ground, to allow for changes in the message length, the frequency of which messages are sent, and a few other parameters. The software also accepts the “sever” command for the cut-down mechanism, which may prove to have use in future flights as a cut-down or parachute delay mechanism. 0 minutes – with a small speech and the dual-salute, EFT-3 is sent off. She disappears into light mist falling from the thick clouds. We flew down to NC for this; we weren't about to scrap our launch just because of a little rain! 1 minutes – Communications have already ceased. Although not unexpected this flight, we had hoped to maintain communications a little longer before losing contact. A plot of temp vs. time shows that the temperature is much more reasonable with 2 hand-warmers. And now we wait. 75 minutes – modeled landing time. Still no messages have been received. 100 minutes – our team parks at a Methodist Church just outside the tree farm. After reading the posted signs that just forbid firearms and hunting on the land without a permit, we proceed to walk the mile or so towards EFT-3. SMS messages are still coming in loud and clear. As we proceed along the banks of a small stream, we near the location where the EFT-3 TM beacon has been emitting from. Tall trees on our right, but small trees to our left….still praying that EFT-3 landed a little to the left. 120 minutes – we see her, and she’s on the ground! After de-tangling the lines from thorn bushes, we start the trek back out. EFT-3 marks the first successful recovery of a launch, including access to both the FDR data and camera pictures. Although it appears that the balloon may have burst earlier than anticipated (even for the overfill condition), the descent ended up going much longer than expected, so we lucked out in not having it go as high as it could have. The pictures up at the high altitudes indicated that the payload was experiencing severe sway, potentially flipping end over end at times. It is also worth noting that the balloon to parachute attachment line had wound itself around the parachute suspension lines about half way up, which effectively reduces the line length and hence reduces the drag coefficient of the parachute. For future launches, a longer balloon to parachute attachment line should help increase stability, and hence make it more stable on ascent. Furthermore, a parachute deployment mechanism (potentially utilizing the cut-down device hardware) that waits until a prescribed altitude before deploying the parachute would decrease the changes of any lines tangling and reduces the distance and time that would be required for recovery. Comparison of the actual GPS (red) with pre-flight predictions (yellow) show good correlation with winds, taking into account earlier than expected burst of actual system. For those interested, the plot of temperature vs. altitude shows that our hand-warmers and cooler insulation design maintained the cell phone temperature within a desirable range for the duration of the flight. With one launch under our belts, but the hardware being several hundred miles out at sea, we were determined and eager to head back to the skies as soon as we could reasonably determine the root cause of the failure on EFT-1. After analyzing the Telemetry data, we were able to tweak the input parameters in our Python flight simulator model, and obtained our best educated guess as to demise of the ill-fated EFT-1. Despite the bone-numbing, frigid conditions of our first launch back in November, here we were again packing the car at 7AM in balmy 3F conditions. After having driven out to Albany, NY the previous night to crash at a friend's apartment, the car was packed and we embarked for the launch site. With a planned launch date of January 10th, the winds for the weekend necessitated a trip out to Albany, NY for an estimated recovery around Nashua, NH. Parametric studies were run for various configurations of nozzle lift (total lift minus the weight of the balloon), weight, and descent drag of the parachute to ensure that we would have all the information necessary on launch day to bound our predictions. In addition to much more rigorous flight planning, the highest risks for EFT-2 were assessed and ranked to maximize the probability of success. Both the cell phone life at cold and cell phone coverage at the landing zone were the highest impact risks, since either occurrence would likely mean we would not be able to find and recover EFT-2. Lesser risks included flight sim model inaccuracies resulting in an uncertain landing location, and the very high probability that EFT-2 would land in a tree and could be found but not easily recovered. Similar to EFT-1, the Telemetry (TM) phone would act as a Flight Data Recorder (FDR) in-flight by recording accelerator data, temperature, GPS, and much more for us to analyze. In terms of recovery, the phone would send us an SMS text message once back on the ground in order to locate the payload for recovery. After final pre-flight checks the night before (OK, maybe it was 2AM the morning of...), the launch-site selected was at a school just south of Albany, NY, ensuring that we were outside of controlled airspace and not in line with any of Albany’s runways. A team of five people were present to help out, which proved invaluable since the temperature was a frigid 10F at launch, and the extra help allowed us turns to swap out and warm our hands. The QuikFill inflation system worked wonders! A quick attach/detach allowed for periodic nozzle lift checks, and the direct attachment to the CGA-580 valve on the helium tank meant there was no chance of any Helium leaking during the fill. After preparing the payload, enabling the TM phone, and completing the filling of the balloon, the initial launch parameters were recorded and EFT-2 was determined a GO! Final Payload Weight 1.5 Lbs. Measured Nozzle Lift 7.2 Lbs. Free lift (Nozzle lift – payload weight) 5.6 Lbs. 0 minutes – and she’s away! Godspeed, EFT-2. 2 minutes - with the balloon climb rate seeming to be on target, the first few minutes of the launch seemed to bode well for EFT-2. 3 minutes - communications unexpectedly cease. Noticing how the temperature had been slowly creeping up over time from 25C all the way to 50C at our last telemetry response, a sinking feeling developed in our stomachs (and yes, we did in fact just switch to SI units...much more useful when doing anything except describing the temperature outside!). Pre-flight testing with the TM phone indicated that it would shut-down due to overheating somewhere around 56C. Is it possible that the phone shut-down and EFT-2 would suffer the same un-recoverable fate as EFT-1? Only time will tell. 60 minutes - still not a single comms message has been received since 3 minutes. Powered off a mix of caffeine and adrenaline, we frantically continue monitoring for any sign of the Dogeship, but concerns continue to grow that the phone shut-down due to over-temp and that there will be no way to find it once she lands. 84 minutes - CONTACT! SMS messages with GPS coordinates have been received, and EFT-2 is on the ground in Bernardston, MA (Zip code 01337 – yes, 1337). Re-route the car GPS and off we go to shoot up Rt. 91 from the Mass Pike. 90 minutes - only miles away from EFT-2, a major accident on the highway has traffic backed up for miles, and we’re caught right in the middle of it. Excited yet frustrated that we aren’t moving faster, we press on. 120 minutes – we arrive at the site, and spot something orange from the road. It’s a decent way in on someone’s property. Knocking on their door, we obtained permission to take a closer look and headed out to find EFT-2. Unfortunately, EFT-2 will not be recovered today (or any time soon). She’s 80+ft. up in one of the tallest trees amidst branches. Stay tuned for updates on the recovery efforts thus far and the one planned that will hopefully bring her down. Overall, EFT-2 was a giant success, despite the fact that she is still 80 ft. up in a tree in Bernardston, MA. All primary objectives were accomplished, and the tree landing was not unexpected, as predicted by our top pre-flight risks. On future flights, it will be expected that we will lose communications after takeoff, but that the FDR will record all the data for us to recover after, and that the TM phone will prove a reliable location technique once the payload is back on the ground. Also, we wanted to give a shout-out to the awesome launch crew that helped us out: a huge thanks to Dave, Andrey and Brian for helping with the launch! I vigorously rubbed my hands together to stave off the frigid winds of a late November Vermont - the weather forecast had called for clear skies and calm winds, but the reality that we came upon was far from it. To my left Brian knelt in a freshly plowed parking lot, holding a rapidly expanding weather balloon whipping around dangerously in the wind. This stage of flight is the most dangerous for the mission - one wrong gust of wind could cause the balloon to bend too severely and break or, worse yet, be torn from our hands, doomed to a quick climb with our payload still on the ground. I was working quickly to prepare our payload for its voyage into the upper reaches of Earth's atmosphere, working against the clock to release the balloon as soon as it was inflated and with enough battery to last to landing. We were confident in our planning - our first launch will be a success! 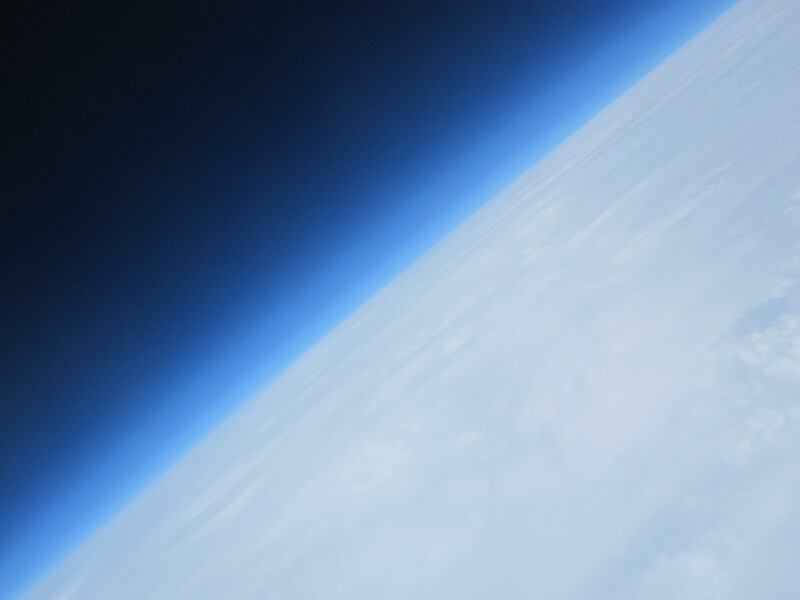 Our goal was and still is to be able to reliably launch a space balloon on a small budget, aiming to develop a machine that could be launched by anybody who truly wants to. The culmination of a few months of research and planning resulted in this launch of what has come to be called the DogeShip-class spacecraft. The Doge is a rugged and simple ship made of completely 'off the shelf' parts. The system is essentially a cell phone placed into a cooler with a camera duct-taped to the side. The cell phone is running a Python script which report back the balloon’s current position and altitude. Additionally, the phone acts as a flight data recorder (FDR), saving off position, altitude, time, acceleration, and magnetometer information every second. The hope is that the simplicity of the system, along with some pre-flight planning, would result in a reliable launch and recovery. The time it took to research, design, and build the first Doge led to an unfortunate launch time and location - November in New Hampshire, a cold and windy first space launch. Launch Day was to be November 28th, 2014 with a targeted landing zone of Mt. Kearsarge State Park in New Hampshire. We picked that landing zone because it is a rural area where we would be less likely to hit someone's property, it has enough roads and hiking trails that we could get wherever we needed fairly quickly for recovery, and the mountain had a cell tower on top, ensuring a strong cell signal in the area to get a location text message back from the Doge. Jumping out of the car into 10 degree temperatures we set immediately to work. We had done a lot of thinking about what needed to be done and put together a pre-launch plan but as many know, no plan survives first contact. The first problem we encountered was not understanding how the pressure regulator worked. We had assumed that once you turn the gas on that it would start flowing into the attached balloon, in reality we were not provided a scientific pressure regulator but a party balloon pressure regulator. As we troubleshot what was preventing the gas from flowing we inadvertently destroyed our filling system. Once we figured out how to get the helium flowing (hint if you’re ever using this kind of regulator – bend the plastic protrusion to open the fill valve), we began filling the balloon at the maximum rate. We encountered a second problem: our research indicated that filling the balloon would take 30 minutes – in reality it took 5! Those extra 25 minutes were intended to prep the remainder of the payload and get the telemetry system working and validated. I rushed around tying strings, shaking hand warmers to activate, and enabled the telemetry system, all while a 5 foot diameter, fragile balloon was blowing around in 10 degree winds. There is an old adage that says that things happen in threes… well this launch fell into that category. Problem three - in ballooning, few numbers are more important than ‘Free Lift’. Free lift is defined as the total lift produced by the helium minus the weight of the payload. This number drives how fast a balloon will climb through the atmosphere which directly relates to how far it will go over the ground. We had planned for a free lift of around 3.5 pounds and what we measured was actually 0.6 pounds – the Doge could barely pull itself off the ground. This was a major problem – all of our preflight work was out the door and there was no way we were going to hit Mt. Kearsarge. There we stood, a Doge fully primed and ready blowing in the freezing wind and having to make a launch or abort decision. After weighing our options, we decided what the heck - we were there, we were ready, and we needed some practical experience and data. Throw caution to the wind, its time to fly! 0 minutes - It's flying, it works!! The balloon slowly rose into the sky, with the payload swaying underneath as it rose through the winds. After barely clearing a hill, it rose out of sight as we packed. So begins the chase. 10 minutes - a quick stop for a warm up coffee allowed us a first look at telemetry being sent from the balloon. My eager excitement quickly turned into shock – the balloon was not rising at the predicted 15 miles per hour, but at an anemic 3 miles per hour. Seeing as it needed to get at least 10 miles high to burst, that put the minimum climb time at around 3.5 hours, 4.5 hours if we included the descent. We all looked at each other and instantly had the same conclusion: “She’s going into the ocean”. 30 minutes - a telemetry update showed that DS-1 was about to enter New Hampshire - we were about to have an inter-state spacecraft! The balloon was barely crossing through 10,000 feet at its steady 3 miles per hour climb. 50 minutes - we have had radio silence for quite some time, but knew that the original prediction should have the balloon at roughly its peak altitude of 75,000 feet. We got a sudden, single telemetry message – it was at 15,000 feet and 20 miles south of Mount Kearsarge, the planned landing point, and still climbing! This spacecraft was quickly heading for a watery demise in the cold north Atlantic Ocean. An updated prediction indicated a flight over Manchester, NH and the recovery team was once again re-dispatched. 90 minutes - after yet another period of silence, an unfortunate message was received. The balloon was at 27,000 feet over Manchester, travelling at 60 mph in level flight. We had what the weather balloon community calls a ‘floater’, a balloon that is neutrally buoyant and will not longer climb or descend. One final prediction showed that the balloon would pass over Glouster, MA as it cruised out to sea, heading for the Atlantic Grand Banks. This confirmed our initial assumptions from the coffee shop – DogeShip-One is heading for the drink. 130 minutes - This was the time that she was predicted to cross over the coast and head into the Atlantic. We still had not heard a thing from the Doge since the last update over Manchester. We were all hoping for a miracle reporting the Doge on the ground near the coast, but that was just wishful thinking. We concluded that the Doge was lost, to be found one day by a mariner or a kid in Nova Scotia as a message in a bottle. Perhaps one day we will get an email on our recovery address from somewhere in the world about a found Doge! The frigid launch of our first weather balloon was a massive learning experience. We had gone into it with high hopes, but the expectation that there was a pretty good chance we would not get the balloon back. Our main intention was to put a stick in the ground, establish what we knew and understood, and what we needed to learn more about. A thorough post-flight analysis was done using what data we had available to understand what happened to cause the launch to go so wrong. That information largely informed the improvements made before the second, mostly successful, launch a month later - DogeShip 2. A subsequent post will be made in the near future about the post-flight analysis that we did, and the new information gained that led us to successful follow-up flights! Thanks to Alyssa, Sarah, and David for the assistance!